Psoriasin (S100A7) expression has previously been associated with psoriasiform hyperplasia as well as with tumor progression in breast cancer. Its expression profile for different stages of skin lesions is unknown. The aim of this study was to determine the relationship between psoriasin (S100A7) and tumor progression in skin. Psoriasin was assessed by immunohistochemistry and levels of expression determined by semi-quantitative scoring in skin biopsies from 50 patients. The cohort included normal skin, actinic keratosis, squamous carcinoma in-situ, invasive squamous cell carcinoma, and basal cell carcinoma. In normal skin, psoriasin was rarely detected in epidermis but was expressed in underlying adnexae. In abnormal epidermis psoriasin was frequently expressed in abnormal keratinocytes in actinic keratosis, in-situ and invasive squamous cell carcinoma, but was rarely observed in the basal epidermal layer or in superficial or invasive basal cell carcinoma. The highest levels of expression were seen within squamous carcinoma in-situ. Significantly reduced levels of expression were observed in both unmatched (p = 0.0001) and matched (p < 0.004) invasive squamous cell carcinoma. Psoriasin expression within abnormal squamous lesions correlated with mitotic count (r = 0.54, p = 0.0036), however no significant relation was found with the intensity of dermal inflammatory cell infiltrates assessed within each pathology. These results suggest that altered psoriasin expression occurs in abnormal epidermis and that downregulation may be related to the onset of invasion in squamous cell carcinoma in skin. Psoriasin (S100A7) is a member of the S100 gene family  and was first identified as a 11.4 kDa secreted protein expressed in skin involved by psoriasis . It was subsequently shown that psoriasin expression is also present in other inflammatory skin conditions  and that psoriasin can exert a chemotactic influence on inflammatory cells , suggesting that it may play a general role in this aspect of inflammatory skin diseases. However, its pattern of expression in skin is also associated with altered keratinocyte differentiation [5, 6], and psoriasin has been found to be expressed in squamous cell carcinomas of bladder [7, 8] and in breast carcinoma [9, 10]. In the latter, increasing expression parallels early stages of tumorigenesis and psoriasin is highly expressed in ductal carcinoma in-situ, but psoriasin is often downregulated in adjacent invasive carcinoma . Psoriasin is thus also associated with altered and abnormal pathways of epithelial cell differentiation. In the present study we have examined psoriasin expression in dysplastic, pre-invasive and invasive skin lesions to determine the relative importance of the relationship with inflammation and tumor progression in the skin. The study cohort was selected from the archives of the Department of Pathology, Heath Sciences Center, Winnipeg Canada, from skin surgical biopsies and resections. In each of 5 categories, half the cases were selected to show either minimal or prominent inflammatory infiltrates within the dermis. The cohort comprised paraffin tissue blocks from 50 patients in the following categories: normal skin (n = 10), dysplastic actinic keratosis (10), squamous cell carcinoma in situ (10), and mixed in-situ and invasive squamous cell carcinoma (10), and basal cell carcinoma (10). The latter category also included 2 superficial and 8 invasive types. Mitotic count was assessed in 3 representative high power fields within squamous lesions. Psoriatic skin lesions (x3) were also stained as positive controls. Immunohistochemical staining (IHC) for psoriasin was performed essentially as previously described , but using an automated tissue immunostainer (Ventana Medical Systems, Phoenix, AZ, U.S.A.). The specificity of the primary antibody (concentration 1: 3000) has been previously described . Psoriasin expression was assessed by light microscopy. Expression levels (Psoriasin IHC score) were determined by semi-quantitative scoring derived from estimation of the product of the intensity of psoriasin expression and the relative proportion of positive epithelial cells within the entire specimen and lesion when present . Statistical analysis was performed with Prism Graphpad software and using Mann Whitney test and Wilcoxon rank sum tests as appropriate. Psoriasin expression was absent in normal epidermis, however there was occasional staining seen in normal adnexal structures and there was high expression seen in all psoriatic lesions stained as positive controls (Fig. 1). Psoriasin expression was prominent in most dysplastic and neoplastic epidermal lesions (Fig. 2) and also in hyperplastic benign epithelium at the border of some lesions. Strong cytoplasmic and nuclear staining was seen as previously described  within the superficial epidermis but was absent from the stratum basalis. Staining was also occasionally noted within stromal elements of the dermis adjacent to regions of high epithelial cell expression, but not in more distant areas. Immunohistochemical detection of psoriasin in normal and psoriatic skin Pattern of psoriasin expression in normal skin and psoriatic lesions detected by immunohistochemistry. Psoriasin is absent from normal dermis, epidermis (A, double arrow), and eccrine glands (A & D, single arrow) but is expressed in hair follicles and occasional associated sebaceous glands (A & C, asterix). 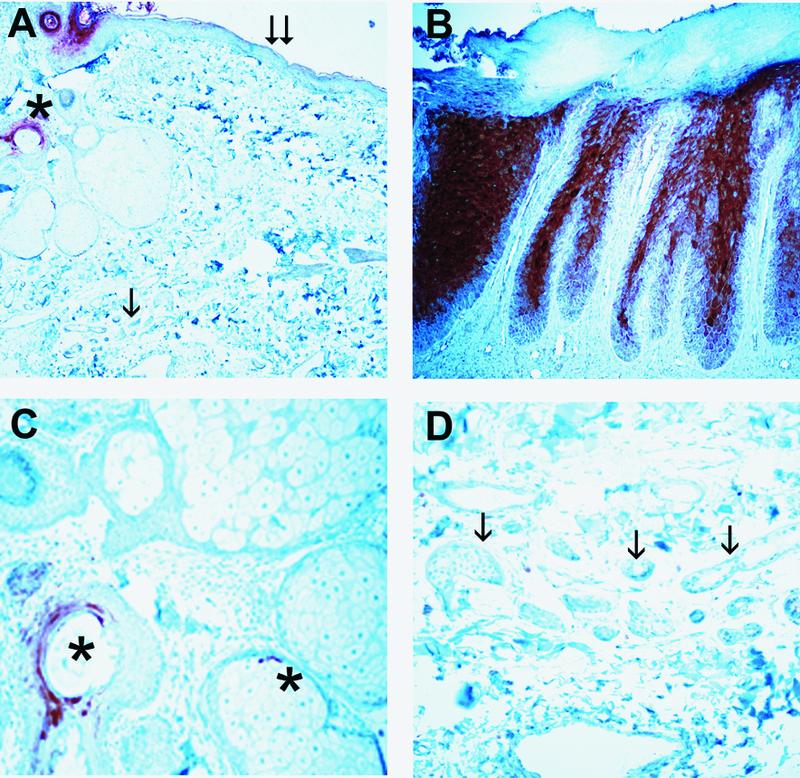 Psoriasin is highly expressed in superficial layers of epidermis within psoriatic lesions (B). Original magnification A&B 200×, C&D 400×. Immunohistochemical detection of psoriasin in skin Pattern of psoriasin expression in pre-neoplastic and neoplastic skin lesions detected by immunohistochemistry (panels A,C,E,F) with corresponding areas from H&E stains (panels B,D,F,H). Psoriasin is moderately (A, right) or highly (C) expressed in carcinoma in-situ alone and carcinoma in-situ associated with invasive carcinoma (E, upper), and downregulated in invasive squamous carcinoma (E, lower). Psoriasin is absent in invasive basal cell carcinoma (G, upper) in comparison with adjacent positively staining normal hair follicles (G, lower right). Original magnification, 200×. The level of psoriasin expression was determined by semi-quantitative scoring and assessed in relation to lesion type (Fig. 3A). In squamous cell lesions, psoriasin was expressed at moderate levels in actinic keratosis, at significantly higher levels in all cases of carcinoma in-situ (Fig. 2C), and at significantly lower levels within the invasive component in all cases of invasive squamous cell carcinoma (Fig. 2E). Psoriasin expression was observed in only one case of basal cell carcinoma and was limited to regions of apparent squamous cell differentiation. There was no significant difference in the level of psoriasin expression within in-situ carcinoma occurring alone or within in-situ carcinoma components associated with adjacent invasive carcinoma. The difference in levels observed between unmatched cases of in-situ and invasive carcinoma was also evident when in-situ carcinoma was compared to adjacent invasive components within the same case (Fig. 2E). 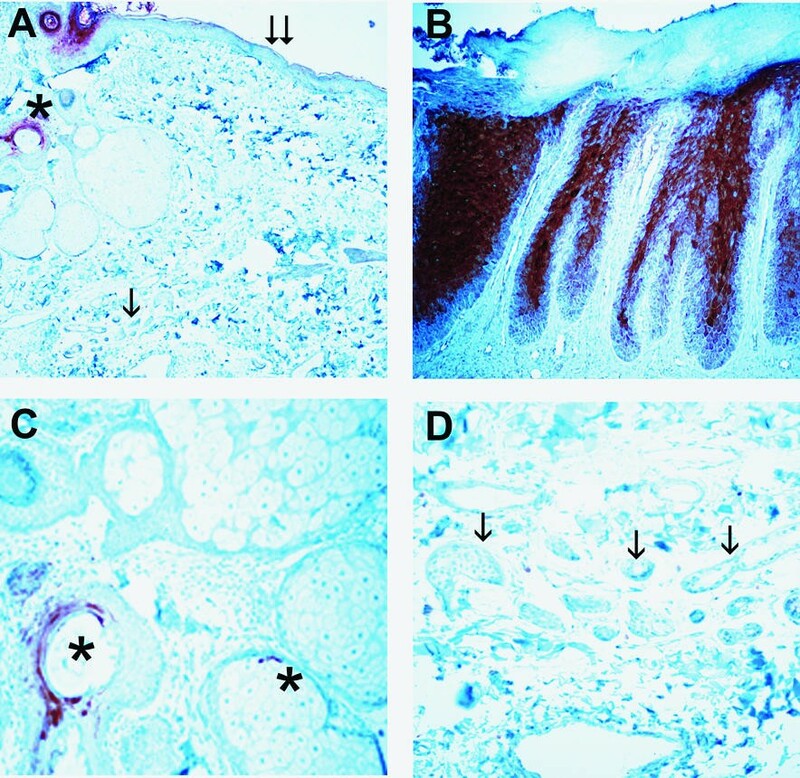 Downregulation of psoriasin within the invasive component was observed within 9/10 cases (Fig. 3B). Psoriasin expression relative to lesion type Panel A: distribution of expression within cases with normal skin (N), actinic keratosis (AK), squamous carcinoma in-situ (IS), invasive squamous cell carcinoma (INV), and basal cell carcinoma (BCC). Bars represent medians. All p values were determined by Mann Whitney test. Panel B: comparison of expression within individual cases between areas of squamous carcinoma in-situ (IS) and invasive squamous cell carcinoma (INV). The p value was determined by Wilcoxon Rank Sum test. Psoriasin expression correlated with mitotic rate in squamous epithelium and lesions but not in basal cell carcinomas. The mitotic rate in squamous epithelium assessed in all 'categories' (normal, actinic keratosis, in-situ and invasive squamous carcinomas) showed a strong correlation with psoriasin expression (r = 0.73, p < 0.0001) and this relationship persisted when normal skin was excluded and analysis was restricted only to squamous pathologies (r = 0.54, p = 0.0036, Fig. 4A). There was no statistically significant difference in psoriasin expression with and without marked inflammation, either within each pathology category or between all lesions combined (Fig. 4B). Psoriasin expression relative to mitosis and inflammation within lesion type. 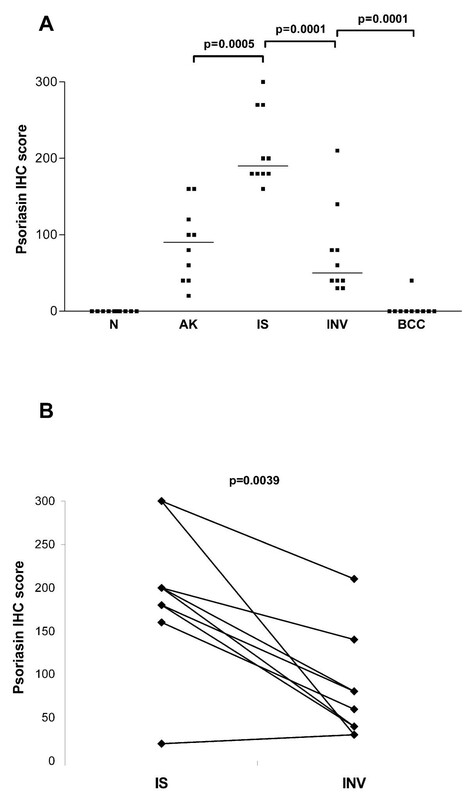 Panel A: Psoriasin expression levels determined by IHC score relative to mitotic count in squamous epithelial pathologies (actinic keratosis, squamous carcinoma in-situ and squamous invasive lesions). 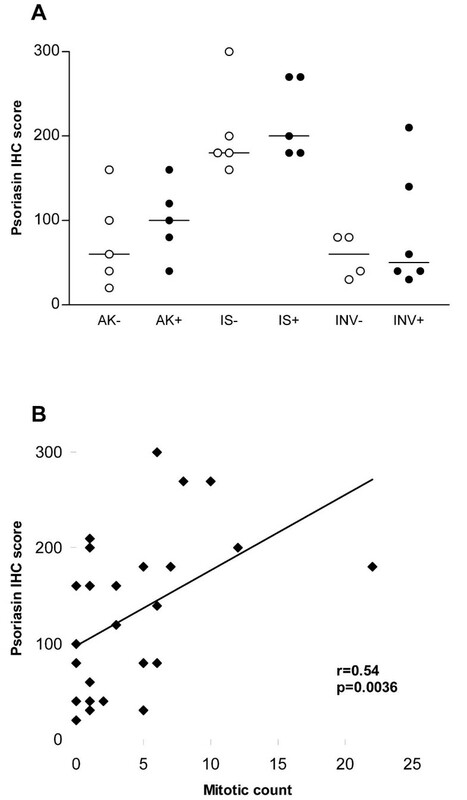 Panel B: Psoriasin expression levels determined by IHC score relative to inflammation within each lesion type. Distribution of expression within cases without inflammation (-) and with inflammation (+) for actinic keratosis (AK-, AK+), squamous carcinoma in-situ (IS-, IS+), and invasive squamous cell carcinoma (INV-, INV+). Bars represent medians. P values determined by Mann Whitney test. The S100 genes encode small proteins that share EF-hand helix-loop-helix domains that are important for their function as calcium binding proteins  and many potential biological roles . Altered expression of several S100s has also been implicated in cancer progression [13–17]. Psoriasin (S100A7) was initially identified as a protein highly expressed in abnormally differentiating keratinocytes derived from psoriatic skin . It was subsequently identified as a gene overexpressed in squamous cell carcinoma of the bladder  and in primary invasive breast tumors . We and others [10, 18]. have also shown that psoriasin expression is low in normal breast epithelium, increased in pre-invasive preinvasive ductal carcinoma in-situ and that it can be downregulated in adjacent invasive components . In contrast to several other S100 proteins , psoriasin expression is restricted to the epithelial component in those tissues where it has been studied, such as skin, breast, and bladder [3, 7, 11, 20]. In epidermis, psoriasin is expressed infrequently and at low levels in normal epithelial cells, but can be highly induced in keratinocytes under specific pathological circumstances. These include hyperplasia associated with inflammatory skin lesions and dysplasia associated with neoplastic progression. A recent SAGE analysis identified psoriasin amongst a small subset of genes highly and consistently overexpressed in actinic keratosis compared to normal skin . Several of these genes, including psoriasin, are located in the 'epithelial differentiation complex' region on chromosome 1q21 . Our results here show that psoriasin is not expressed by either normal or abnormal basal cells (in superficial basal cell carcinoma), indicating a specific association with squamous cell differentiation. However, while factors related to cellular differentiation clearly comprise an important aspect of the regulation of psoriasin , the downregulation that is frequently seen in squamous and breast ductal carcinoma cells within invasive compared to in-situ components , suggests regulation by additional factors that may also be associated with the invasive process. Dedifferentiation may also be an integral step in the invasive process . Several specific factors have been implicated in the regulation of psoriasin, including retinoic acid which is intimately involved in the control of squamous cell differentiation . Psoriasin is also regulated by calcium, UV irradiation, and altered cell adhesion in the skin [11, 24–28] and stress related factors such as growth factor deprivation, confluency, and loss of adhesion in breast epithelial cells [9, 18]. Examination of the promotor confirms an important role for regulation by the AP-1 transcription factor complex , consistent with the known role of c-jun and JNK activation in the cellular response to UV stress . Activation of the AP-1 pathway is also known to be important in skin tumorigenesis, progression and invasion . The biological function of psoriasin remains to be fully understood. The association with psoriasis  other inflammatory skin diseases  and both in-vitro  and in-vivo  studies in skin and breast  suggest a role as a secreted chemotactic factor. However, in the current study, no significant relation was found with the intensity of dermal inflammatory cell infiltrates. It is possible that the marked changes in psoriasin expression that are apparent with cellular differentiation and progression, obscured a relationship with inflammation within the small subgroups of each category of pathology. It is also possible that psoriasin has less influence on inflammatory responses in neoplastic as opposed to inflammatory skin disease or that other cofactors are present and necessary for this action in inflammatory skin pathologies. Psoriasin may also have other functions within epithelial cells. It is apparent that while psoriasin is secreted it can also be localized within keratinocytes and breast cells , in common with other S100 proteins . Interactions with intracellular fatty acid binding proteins and transglumatinases [12, 33]. have also been reported and possible intracellular functions that have been proposed include roles in either altered differentiation , resistance to apoptosis , or tumor invasion . The possibility that psoriasin might provide a clinical marker for pathological diagnosis has previously been considered. Psoriasin may be a useful indicator of squamous differentiation for tumor subclassification, and while this may have little practical clinical significance in the management of skin tumors, in some systems such as uterine and bladder tumors this may have prognostic significance [7, 8]. The potential role as a predictive factor for progression in pre-invasive squamous and breast lesions remains to be determined. These results show that psoriasin expression is altered in association with early stages of skin tumorigenesis with highest levels of expression within preinvasive squamous cell carcinoma in-situ and downregulation in invasive disease. A possible functional role in mediating invasion remains to be explored. Supported in part by the Canadian Breast Cancer Research Initiative, the U.S. Army Medical Research and Materials Command (USAMRMC), and the Canadian Institutes for Health Research (CIHR). P.H.W. is the recipient of a CIHR Scientist Award. E.E. is the recipient of a USAMRMC Predoctoral Traineeship Award. SA analyzed psoriasin expression in tumor sections, conceived the study and participated in its design. GQ assisted in the analysis of tumor sections. EE provided psoriasin antibody and assisted in drafting the manuscript. LS carried out the immunoassays. PW conceived of the study, drafted the manuscript and participated in its design and coordination. All authors read and approved the final manuscript.